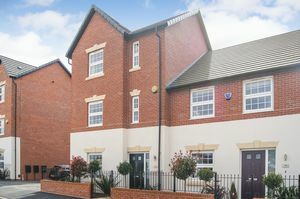 A superbly presented four bedroom, three storey modern townhouse completed in approximately May 2018, and situated in the very popular Heddles development on the outskirts of the town. Owing to a change in vendor's circumstances the property is now for sale and with NO CHAIN. In addition to the four bedrooms, this delightful family home has a wonderful open plan ground floor to include contemporary kitchen, dining area and lounge. 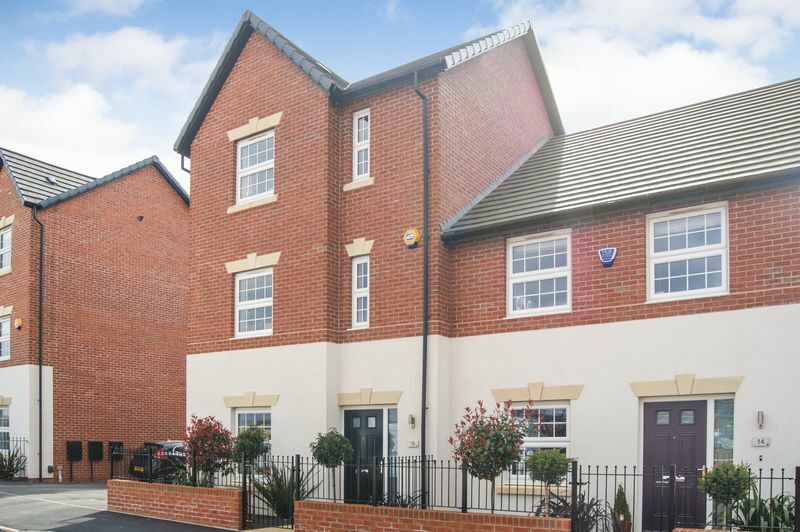 This home comes complete with all floor coverings, an alarm system and a garage. Viewing strongly recommended. The reception hallway has the staircase rising to the first floor and a door providing access to the ground floor accommodation. The hallway itself is complemented with contemporary ceramic floor tiling and also has a ceiling light point and a radiator. The above measurement includes the kitchen, dining and lounge areas as a whole. 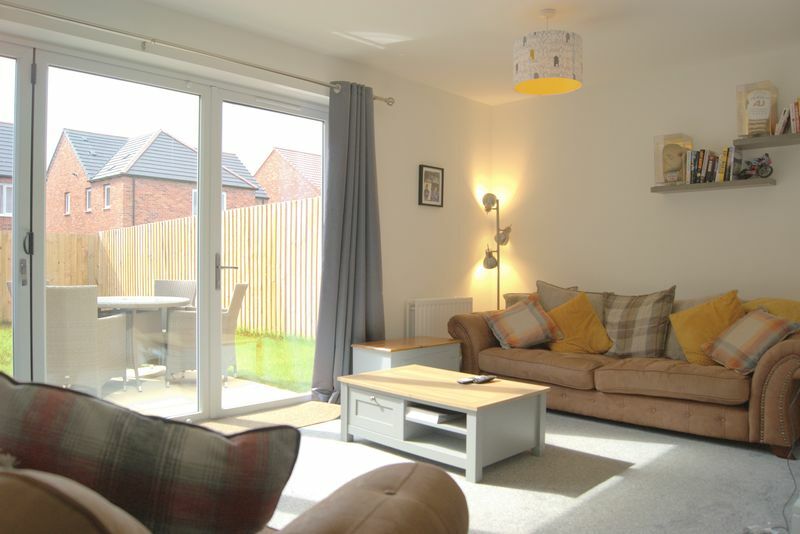 This room is nicely proportioned and informally divided to provide separate living, dining and lounge areas. 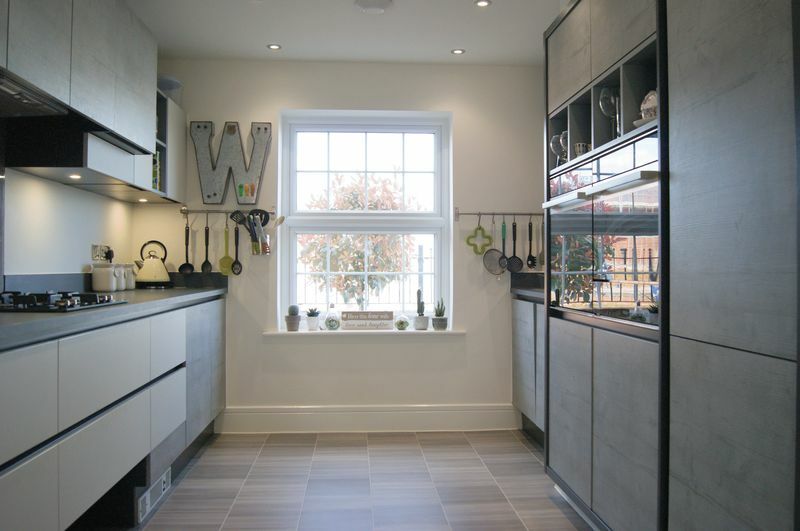 The kitchen area has a window to the front elevation and is fitted with a comprehensive and very contemporary range of base and wall units with contrasting square edge work surfaces and splash backs. There is a one and a half bowl stainless steel sink, an integrated eye level oven and microwave, and a gas hob with extractor hood above. There is also an integrated fridge, freezer and dishwasher. 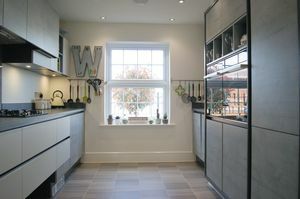 The kitchen area is complemented with the same ceramic tiled floor that flows through from the hallway, recessed ceiling spotlights and a kick board heater. 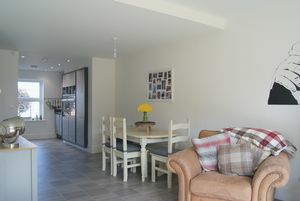 The dining area is situated between the lounge and the kitchen and has the same ceramic tiled flooring that flows through from the kitchen area, a ceiling light point and a radiator. Situated adjacent to the dining area is a useful storage cupboard which is sited beneath the staircase, within this cupboard is space and plumbing for a washing machine. Next to this cupboard is the downstairs cloakroom. The cloakroom is fitted with a wash hand basin and WC and has ceramic tiled flooring and part ceramic tiled walls. 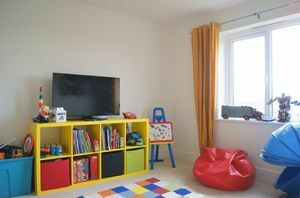 The room is further enhanced with recessed ceiling spotlights and also has an extractor fan and a radiator. This delightful area has bi-fold doors to the rear garden making this part of the room particularly bright and airy. The lounge area has two ceiling light points and a radiator. As mentioned, the staircase rises from the reception hallway to the first floor landing where bedrooms one and four are located. The landing has a window to the front elevation and a useful storage cupboard. 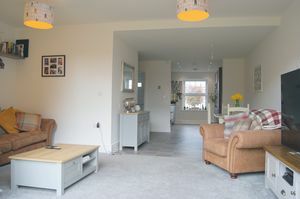 The landing has two ceiling light points and a radiator. The staircase continues to the second floor. 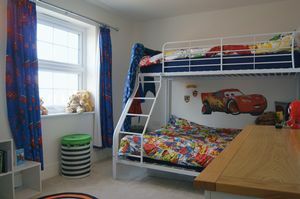 A double bedroom with a window to the rear elevation. This bedroom benefits from having fitted wardrobes with sliding doors. There is also a ceiling light point and a radiator. A door leads into the en-suite shower room. 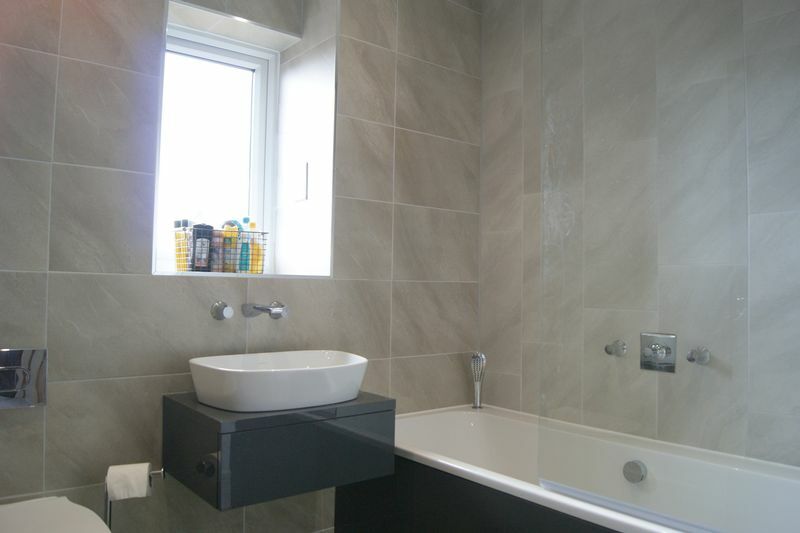 This very well appointed en-suite shower room has an opaque window to the rear elevation and is fitted with a double width walk in shower cubicle with mains rainwater head shower, and also a separate hand held shower attachment. In addition there is a contemporary vanity unit with wash hand basin on set and storage beneath, and a WC. 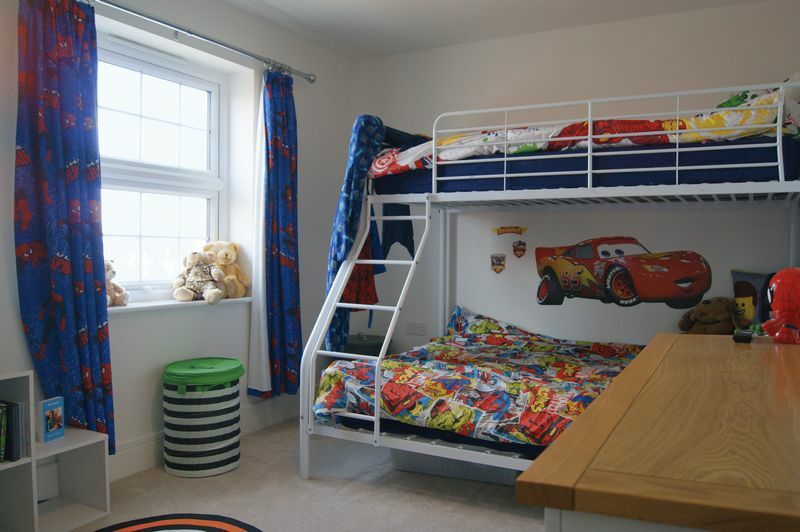 The en-suite has contemporary wall tiles, recessed ceiling spotlights, a heated towel rail and an extractor fan. A good sized fourth bedroom having a window to the front elevation, a ceiling light point and a radiator. The staircase continues from the first floor to the second floor landing which has doors into bedrooms two and three, and the family bathroom. 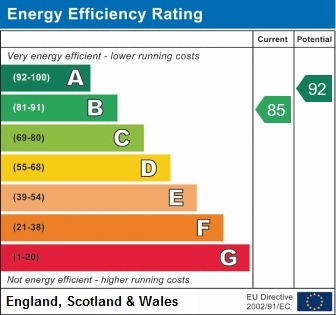 In addition a cupboard housing the central heating boiler is located on this landing, as is access to the roof space. There is also a ceiling light point and a radiator installed. 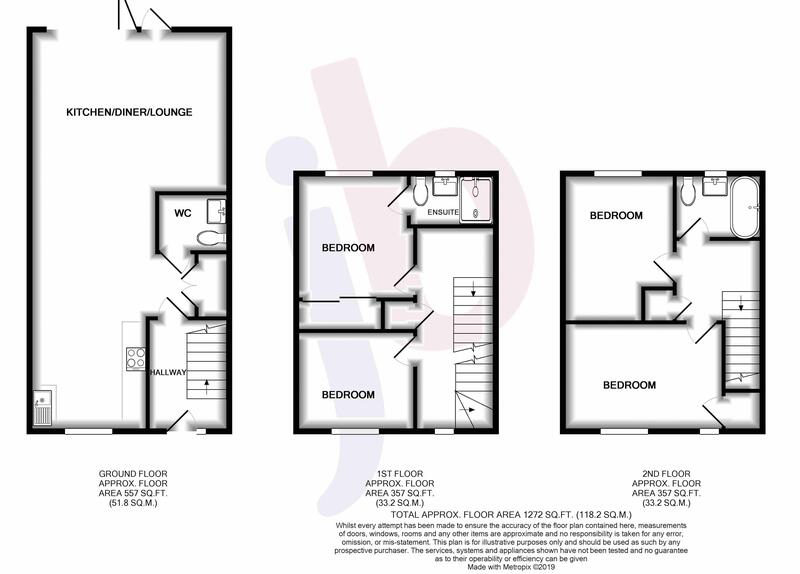 An excellent sized double bedroom with two windows to the front elevation. 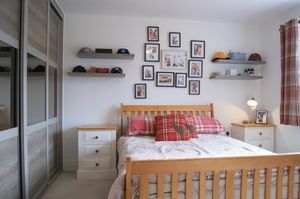 This bedroom has a useful storage cupboard which is sited above the staircase, a ceiling light point and a radiator. A further good sized double bedroom with a window to the rear elevation overlooking the garden. This room also has a ceiling light point and a radiator. 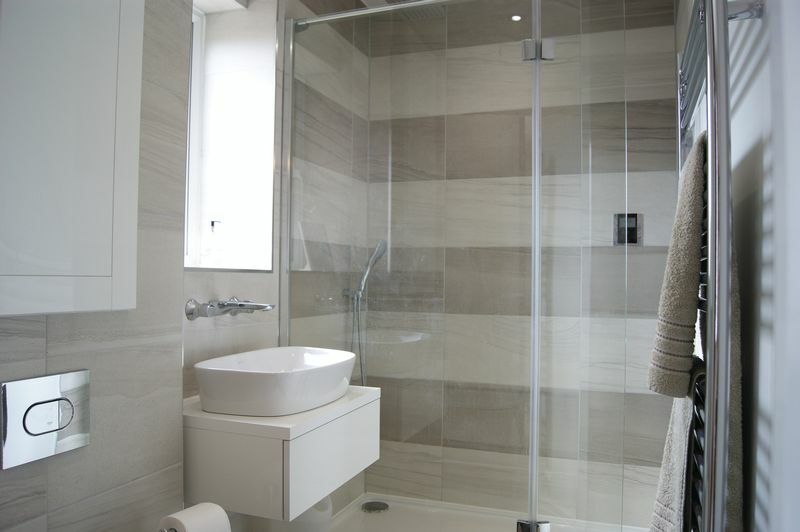 The very well appointed family bathroom has an opaque window to the rear elevation and is fitted with a white suite comprising bath with mains rainwater head shower above, together with a hand held shower attachment. There is also a contemporary vanity unit with wash hand basin on set and a WC. The bathroom is enhanced with contemporary ceramic wall tiling and recessed ceiling spotlights. In addition there is a shaver's socket, an extractor fan and a heated towel rail. To the front of the property is a small enclosed hard landscaped garden which is neatly maintained and has a footpath leading to the front door. 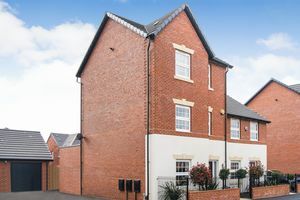 Situated to the side of the property is the driveway which provides off road parking for several vehicles and in turn leads down to the garage. The garage has an up and over door to the front elevation and is equipped with lighting. Accessed from the driveway there is gated entrance into the rear garden which is fully enclosed and laid to lawn. 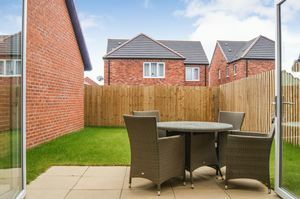 There is a patio area adjacent to the bi-fold doors from the lounge and this in turn provides an ideal outdoor seating and entertaining space.